September 23, 2013 September 29, 2013 Wallace Bishop I.N.H.C, C.N.C. Before you read this I want to share with you that God has given you the amazing strength to pull yourself up from the depths of depression and hopelessness to a life of glorious health. You just have to want it and be willing to put in the effort. There are many true stories of true hero’s that have overcome huge obstacles to achieve greatness. I want to share with you an event I recently experienced that really inspired me. I hope it does you as well. Two weeks ago while riding my bike on a trail we have in our city called the Swamp Rabbit Trail something unbelievable and inspiring happened. I ride the trail almost every day, Monday through Friday. I see all types of people from families walking, roller bladders, roller skiing to bikers in their 80’s. Yes that’s right, I said 80’s. I see a couple in their 80’s at least once a week that ride at least 12 miles that day. Well, today was a very special day. I saw a young man riding a very nice and serious road bike. I am not talking about a bike you just cruise around on I am talking about a $2,000.00 to $4000.00 road bike, the kind professionals ride. What totally blew me away was that he had only one leg and no artificial leg to support him on the other side. As I passed him, I was thinking how is this possible. 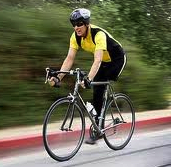 On road bikes of this type we wear special shoes that clip in and out of a special fixture to give you more pedal power. Once your feet are clipped in they can’t slip off of the pedal. They are locked in. It takes practice to understand how to get your feet off in a hurry if you need to. I have fallen several times. I can only guess that to become as good as he is, he has put in an incredible amount of hours to master the physical ability of road biking at this level. He is not the only person with a disability that has mastered this feat. As I am peddling along totally absorbed in this young mans ability to overcome his disability I was overcome by emotion. I guess we shared a common bond of sorts. Not that overcoming my challenges was anything close to his challenges but we were both over-comers. Truthfully, I was just shocked that he could do what he was doing. I hear so many excuses from people everyday about why they can’t beat their obesity or improve their health. After about 5 minutes a blur passed by me and it was this young man with one leg. I consider my self a fair rider with decent speed but this guy just blew by me like I was standing still. I am still trying to figure out how he gets on and off his bike. I hope to meet him one day and let him know what an inspiration he is. There are many people with disabilities that strive to lead a normal life and through their strength and determination they find a way to be a part of everyday life and even reach higher levels like this young man. I am an Over-comer, You Can Be One Too! Eight years ago my physical world was a disaster. I weighed almost 450 pounds, had several health conditions and couldn’t do much of anything I wanted to do . Walking more than a couple hundred feet or standing longer than 5 minutes was very difficult. It was very painful on my knees and ankles and made me short of breath quickly. I was a hostage of my own making. It took me a while to learn, understand and painfully admit that I created my condition. I was once an athlete and took pride in my physical abilities. I routinely worked out, played racquet ball, took martial arts, ran 5 miles 4 days a week. The rest is a blur! What happened? Life happened like it does for most of us. Seven years ago God gave me an opportunity to right the sinking ship my body had become as I began earnestly searching for ways to help my wife overcome debilitating fibromyalgia. You can read about that story here. Anything worth having has a price that must be paid. I saw the opportunity and I took advantage of it. I was willing to pay the price to get my health and life back. It took dedication and resolve and support from friends and family. But what it really took was for me too stop making excuses. I lost over 200 pounds and now thoroughly enjoy my life. I can do anything I want for anyone my age! Three years ago I became ill with a condition called Guillain Barre Syndrome (GBS). It is a form of paralysis that begins in your feet and gradually works it way up your body. Every case is different. For months I could not walk without a walker or use my hands enough to hold a fork or spoon. I am like, wow, I just get my life back and now I can’t walk much less run, hike or bike. At this point I could have climbed inside my shell and blamed God or life and just given up. Many people do just that. I guess I am stubborn. I was not going to let this condition rob me of the life I had just worked so hard to get back. I prayed for God’s mercy and strength to overcome this terrible condition. I was very fortunate in that my case was not as severe as it could have been. I spent 4 days in intensive care and a total of eight days in the hospital before they sent me home to recover. I believe that my new found health and fitness kept me from having a more severe case of GBS. I don’t think I would have survived GBS if I would have been at my heaviest weight. GBS is weird in that your nerves lose their ability to adequately send signals to muscles and as they heal ever so slowly you begin to recover the potential to regain your strength. Strength doesn’t happen without work. Once strong enough I used my walker and would do laps around the house. As soon as I could get on my exercise bike I did. Gwen, my wonderful wife would help me get on the bike (that was a real challenge) and help me balance on it so I could just turn the pedals. Gradually I began to rebuild my body again. What would have happened if I just gave up? I humbly ask you to think about any excuse you have for not trying. Life is not perfect, it is what we make of it. What are you making of your life? What excuses do you really have, honestly? Previous Post Aging, How Do We Slow it Down? Telomeres?